Every pharmaceutical plant has got a prime objective of manufacturing products of required attributes and quality in a consistent manner, at the lowest possible cost. In order to maintain the quality of a drug product and to ensure its safety, process validation has to be done. Every pharmaceutical plant has got a prime objective of manufacturing products of required attributes and quality in a consistent manner, at the lowest possible cost. In order to maintain the quality of a drug product and to ensure its safety, process validation has to be done. It is the essential element in ensuring that a drug product is pure, efficient, save and that its quality is maintained. To be precise, process validation focuses on the knowledge, the aim and the methods of analysis. Process validation is an integral part of quality assurance. This is because the systematic study of systems, processes, and facilities is involved. The main aim of the validation is to determine whether all systems adequately and consistently perform their intended functions as per the specification. Through process validation, process optimization and assurance of quality is attained. Furthermore, process validation ensures a reduction in quality cost and capital expenditures are also avoided. 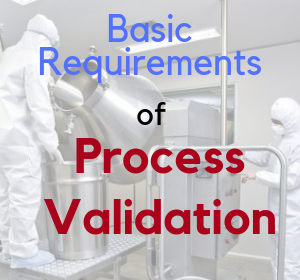 Before undertaking the validation process, it is important to determine whether the equipment to be used in the validation are properly functioning and working within the given range. There also has to be the establishment and the documentation of the validation qualification. Another basic requirement is to ensure that the utilities and equipment are properly installed and are performing or operating as specified. Furthermore, it is important to confirm whether the analytical method has been availed to the plant before the testing. Equipment and instruments that are to be used have to be calibrated and preventive maintenance programs put in place. Important steps and process variables should be identified leading to the establishment of the ranges of operation. Another requirement is about the cleaning of the area and the equipment that have to be completed before initiating the process. Finally, training exercises have to be put in place for the workers on the equipment and the operations. This exercise entails a series of activities that are taking place over the life-cycle of the product and process. For this reason, there are three classification s of the stages involved. These include; process design, where all the activities that are relating to the product research, formulation and development are covered. Here also, the strategy for process controlled is established through knowledge accumulation. Secondly, there is a process qualification which is an evaluation of the first stage. At this stage, standard procedures have to be followed and completed successfully. Lastly, there is the continued process verification which is basically the validation maintenance stage. Industries prioritize the reliability and consistency of a validated process in an aim to attain the production of quality products. The process validation exercise brings about an improvement in the process and the as surety that the process will be performed in a prescribed and controlled pattern so as to achieve the quality of the final product. This process is intended to provide assistance to the manufactures so as to understand the requirements of quality management and the applicability to the process of manufacturing.